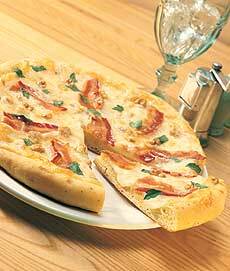 Beyond pepperoni: This White Cheddar Pizza includes bacon and walnuts. Here’s the recipe. Photo courtesy Wisconsin Milk Marketing Board. CAPSULE REPORT October is National Pizza Month. This most popular of American dishes started out as a primitive flatbread and cheese meal somewhere in the Mediterranean region. While pepperoni wins as America’s favorite topping, the folks at Wisconsin Milk Marketing Board—whose members make much of the great cheese that tops your pizzas—have developed some groovy recipes that let you defer the tried-and-true pepperoni, meatballs, mushrooms, onions and pepper for another day. So call your friends, tell them to bring the craft beer or artisan soda, and celebrate National Pizza Month in gourmet style. But before you hit the recipes, chow down on the history of pizza. This is Page 1 of a seven-page article. Click the black links below to visit other pages. The history of pizza as we know it is relatively recent, given how old flat breads and cheese are in man’s cuisine. As far back as 8000 B.C.E., man knew how to mix flour with water into dough, season it with herbs and heat it on a hot stone to create a flat bread (see the history of bread). The earliest cheesemaking began about 5500 B.C.E. The pizza, if it is defined as baked flat bread covered with cheese, could have been invented by the Greeks, the Phoenicians, the people who would become the Romans or anyone in the greater Mediterranean area of the time. With the constant traffic between the worlds of Greece and Rome, plankuntos made its way to what is now Italy, where it became known as pizza. The word “pizza” may have derived from the Latin word “pinsa,” which means flatbread. Pizza became popular street food, sold from open-air stands by vendors, typically young boys who would walk around the city with small tin stoves on their heads, calling out to “hawk their wares” to customers. The pizzas of the time were simple but tasty, topped with olive oil and fresh herbs, not unlike focaccia. Sometimes, some grated sheep’s cheese was added. Pizza was still food for the poor, but soon became a tourist attraction. One of the key elements that turned the baked flatbreads with toppings into what we know today as pizza was the tomato, which was brought to Europe from the Americas in the 16th century. This was the yellow cherry tomato. As a member of the Nightshade family of plants, it was believed by many Europeans to be poisonous, and was appreciated purely as a decorative houseplant. 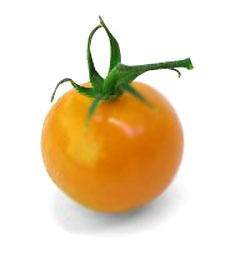 All of today’s tomato varieties were bred from the original tomato, a yellow cherry tomato that grew wild in Peru. Photo by Sophie | SXC. What happened next? The arrival of mozzarella, as you’ll see on the following page. Recipes courtesy of Wisconsin Milk Marketing Board. Other material Lifestyle Direct, Inc. All rights reserved. Images are the copyright of their individual owners.